CHESTER, NY — Inside of an old building in downtown Chester an unlikely business is putting down roots, and gaining fans, with quality craft beer. Consider the fact that the brewery, Rushing Duck, is one of only two breweries in Orange County – the other being the Newburgh Brewing Company. Then, factor in the massive startup costs that a brewery entails, from physical space to equipment and ingredients. Throw in the task of obtaining brewing permits at the state and federal level, and finally, take into account that the owner, Dan Hitchcock, is only 26 years old. Yet there it is, inside of an old tile factory at 1 Battiato Lane, next to wide open Black Dirt fields and nondescript warehouses. You might miss it, though, because there’s no sign indicating its existence. This brings us to another paradox of the fledgling brewery: They don’t advertise. Outside of a few stickers and t-shirts, Rushing Duck doesn’t have an advertising budget. For the owner’s fiancée, Nikki Cavanaugh, it’s a quality thing where they’d rather not skimp on the beer for the sake of an advertising budget. Cavanaugh handles 100 percent of Rushing Duck’s sales and their beer can be found in 30 establishments in the Hudson Valley, including Christopher’s Bistro and Touch Base in Chester. 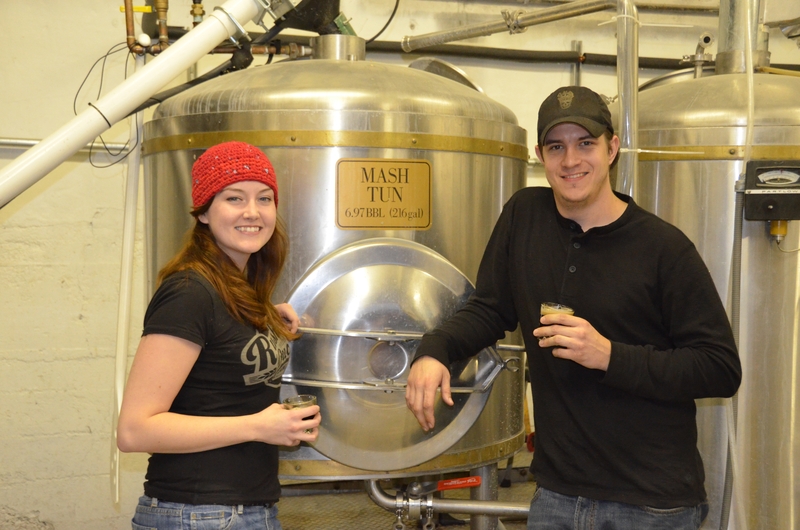 Rushing Duck, which is sometimes called “Russian Duck” by the uninitiated, has two year-round brews: the Naysayer Pale Ale and the Beanhead Coffee Porter, which just won the Hudson Valley Cup at the Hudson Valley Brew Fest last Saturday. Hitchcock, who owns the brewery with his parents, has plans to offer three year-round brews and at least one seasonal concoction once his operation is fully running. On deck is an Imperial Stout for the winter, a heavier beer that’s perfect for shaking off a northeast chill. Their fall seasonal was a whopper of an Imperial India Pale Ale called War Elephant which has since sold out. Inspiration for new brews come from a variety of places; an interesting beer, a taste never before encountered, or a desire to do something that’s never been done. A lot of it is trial and error, seeing what works and what doesn’t on Hitchcock’s small-batch rig that can be likened to a lab of sorts where beers are perfected before production. The names come from the same side of the brain, on a thoughtful whim or random inspiration. For instance, the name for their flagship brew, Naysayer, came about early on when they were dealing with some people who were being negative about them opening a brewery. The Beanhead Coffee Porter? A nickname – Beanhead – that Hitchcock’s mom called him because he was always falling over and hitting his head as a kid. War Elephant? In fourth-century India, armies fed alcohol to their elephants so they would be impervious to pain in battle (hence the brew’s 8.7 ABV). Ever since he was a teenager, Hitchcock knew that he wanted to own his own brewery one day. After more formal brewing education and four years working as a brewer, Hitchcock was ready to venture out on his own. However, his first obstacle was coming up with a good name. “I was struggling for months thinking of a name for the brewery,” said Hitchcock. Inspiration finally came by way of his grandfather. “Him and his friends had a metal pail that they called ‘the duck’ and the act of getting it filled (with beer) was called ‘rushing the duck,’” said Hitchcock. One night he was sitting down to dinner with his parents and they were recounting that story about his grandfather. Hitchcock initially thought it would be a good name for a beer, until he thought a little larger and decided to name his brewery around it. Doesn’t roll off the tongue very well. Hitchcock and Cavanaugh found the building on Battiato on Craigslist. For starters, there were, at the time, no breweries in Orange County. It’s also close to their native New Jersey, where Cavanaugh still works. Chester’s water supply also makes it an ideal location, as a brewery would consume too much water to operate off a well. After the lengthy process of securing a lease and obtaining permits at the local, state and federal levels, they still had to outfit the defunct factory and install brewing equipment. That’s when friends and family stepped in. “You don’t realize how talented your friends are until you need every single person that you know,” said Cavanaugh. Hitchcock’s dad did their heating, ventilation and air conditioning. A friend who does graphic design made their logo. Others stepped in to help where they could. “They’re also very willing to lend their services when they know free beer is going to come out of it,” said Hitchcock. In fact, that’s how a lot of the work at Rushing Duck got paid for, like the tasting bar and the floor. “We have a lot of people on the free beer for life plan,” he said. Rushing Duck also had help from the Newburgh Brewing Company, which started around the same time they did but got on their feet first. Hitchcock and Cavanaugh said the owners of the Newburgh Brewing Company were instrumental in helping them navigate the gauntlet of starting a brewery. For everything else, there’s trial and error, just like the beer itself. Hitchcock said there were times when he’d be operating a jackhammer or agricultural equipment with no idea what he was doing. “I had no education in manual labor, I never used a jackhammer until I had to, I’ve never soldered pipe before until I actually had to solder pipe,” said Hitchcock. So if you have an urge to try something new, beer that is locally produced and consumed, head down to Battiato Lane, to the non-specific building across from the Orange Heritage Trail, and introduce yourself to Hitchcock, Cavanaugh, and James the Cat, who can be found there most Saturdays when free tastings are given from noon to five. Just don’t call them Russian Duck. 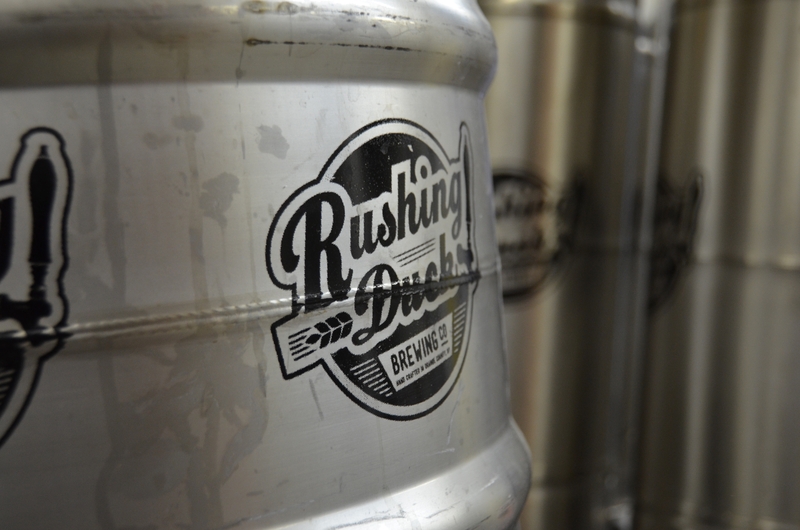 For more information on Rushing Duck Brewing, visit www.rushingduck.com or e-mail info@rushingduck.com. This story was originally published on Nov. 9, 2012, in the Chronicle and other Straus News newspapers. This entry was posted in Misc., News and tagged Beanhead Coffee Porter, beer, Chester, craft brewing, IPA, New York, Rushing Duck. Bookmark the permalink.